The inaugural T20 World Cup not only established the credentials of the shortest format but also gave birth to a leader par excellence in M.S.Dhoni. The concept of cricket matches that lasted 20 overs per innings was still in its infancy when Mahendra Singh Dhoni took over the reins of a young Indian team in the inaugural ICC T20 World Cup in South Africa in 2007. The Men in Blue went on to lift the trophy in dramatic fashion by defeating arch-rivals Pakistan in a nail-biting finale. The keenly contested tournament not only established the credentials of T20 cricket as a format but also gave birth to a leader par excellence in Dhoni. Who can forget the masterstroke from him to throw the ball to an inexperienced Joginder Sharma in the last over of the final when Pakistan needed 13 runs? The Ranchi lad got the job mainly because the holy trinity of Sachin Tendulkar, Sourav Ganguly and Rahul Dravid chose to give the tournament a miss. However, he was a unanimous choice and seniors backed him to the hilt. After a disastrous 2007 ICC World Cup, Dhoni had infused a breath of fresh air in the Indian team. His easy-going attitude rubbed off on his teammates. He scored 154 runs in 7 matches at an average of 30.80 to finish as the second highest scorer for India after Gautam Gambhir. It was the unconventional approach of the captain which guided India to a title win in the inaugural T20 World Cup. After all, convention dictated that Dhoni should have asked more experienced bowlers like Harbhajan Singh to bowl the last over. Dhoni being a wicketkeeper showed signs that he understood the pulse of his bowlers. It is still one of the most talked about decisions made by Dhoni in the tournament or maybe in his entire career. But there was much more to his leadership abilities. The T20 World Cup in South Africa gave a glimpse of what was in store for the future. Apart from an unorthodox approach, Dhoni being a wicket-keeper showed signs that he could understand the pulse of his bowlers. He knew best how to utilise them in different situations. Particularly, when it came to spinners. In fact, a hallmark of Dhoni's captaincy was the manner in which he made Indian tweakers spin a web around opposition batsmen with innovative field placements. He even made superstars out of many part-timers. Another quality which he shared with great leaders like Sourav Ganguly, was his knack to back talent. He showed a lot of faith in his players and in return, they gave only their best. But the biggest strength of Dhoni was his temperament, which made him stand out among the tallest of leaders in modern day cricket. Indeed, his composure in the trickiest of situations helped him weigh the pros and cons before making a call. The Ranchi born cricketer holds the record for the most number of matches as a skipper in the youngest format of the game. He has led Team India to 42 wins in 72 T20I matches, which is the most by any skipper till today. "Not the next Adam Gilchrist. He is the first MS Dhoni"
Adam Gilchrist had once said, " M.S. Dhoni is not the next Adam Gilchrist. He is the first M.S. Dhoni". The legendary former cricketer had made the remark to play down comparisons between the two of them. But in doing so, the Australian in a sense highlighted the uniqueness of the former Indian skipper as a cricketer more so as wicket-keeper. A lot has been said about how unorthodox his technique is behind the stumps. But nobody can dare to disagree that Dhoni is one of the greatest wicket-keepers the world has produced. He boasts of an impeccable record in T20Is. A record holder for the most number of dismissals by a wicket-keeper in T20 Internationals. He is currently on top of the tree for completing 87 dismissals which include 54 catches and 33 stumpings in T20Is while Kamran Akmal is ranked second with 60 dismissals from 58 matches. Dinesh Ramdin is placed third, with a tally of 57 dismissals in 67 matches. 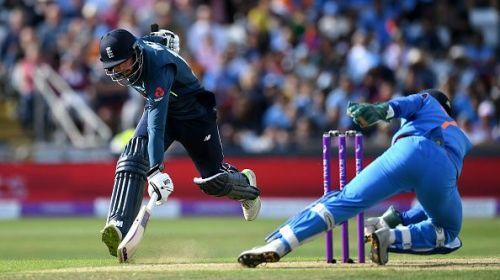 Dhoni's best performance behind the wickets came against England on July 8, 2018, in Bristol where he took 5 catches. It is the joint record for the highest number of dismissals in an innings by a wicket-keeper in T20Is. In the 33 matches that he has played in ICC T20 World Cups, Dhoni has taken 21 catches and executed 11 stumpings. 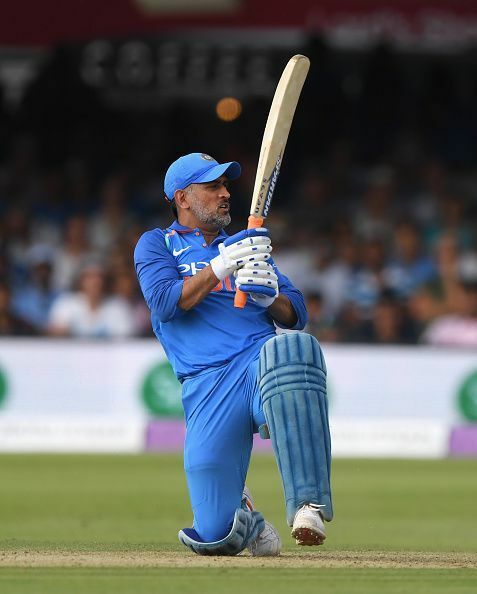 Dhoni who burst into the international scene as a flamboyant batsman with a flair for hitting sixes was tailor-made for the shortest format of cricket. But his record in T20Is is a bit undermining even though he produced many match-winning performances. The Ranchi born cricketer was a part of the Indian team that played its first-ever T20 international match in 2006. Since then he has played a record 93 matches and scored 1,487 runs at an average of 37.17. He boasts of a strike rate of 127.09. Out of the 80 innings that he played, Dhoni remained unbeaten on as many as 40 occasions. He has managed to score only 2 half centuries in T20Is though. The Ranchi born cricketer was a part of the Indian team that played its first-ever T20I match on 1 December 2006. Dhoni who is considered as one of the greatest finishers of the game expectedly has an average of 50.58 while chasing. In fact, he has a slightly better strike-rate of 129.51 batting second in comparison to 125.71 in the first innings. The former skipper batted either at number 6 or 7 for the most part of his career. Dhoni averages 44 as a number 7 batsman. He has however played the most number of games batting in the number 6 position and scored 622 runs at an average of 36.59 in 31 matches. Interestingly, Dhoni has been dismissed for a duck only once in his T20I career so far. It will be more than hard to emulate his performance. But the fact that he was the first captain to lift a World Cup in a completely new format of the game makes him an architect of the T20I revolution. A revolution which has changed the game forever.